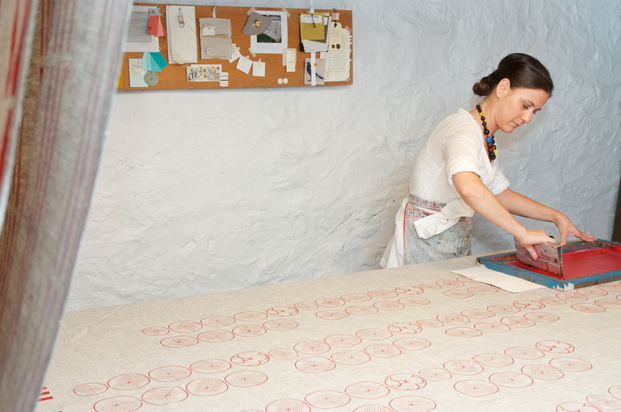 Celina is an Argentinian textile designer living in Tampa, Florida. Her roots, culture and background from Buenos Aires are the imprint of her designs, style and how she lives her life. How she works and what she does is just an extension of who she is. After working in the textile industry for more than a decade, she decided to start her own company--one that would explore outside of the industry standards. She has a passion for preserving the handcrafted work that has long been the hallmark of textile making. She has been influenced by organic fibers and eco-friendly notions turning her vision toward a more sustainable product. Luxury and elegance can be yours everyday with this floor pillow. Hand-dyed by Celina in her Tampa studio using a shibori technique. Insert included. 27" x 27". Pillow insert included. Machine wash warm with like colors. Tumble dry low. Warm Iron if needed.Hand-dyed linen. Genuine leather pull.